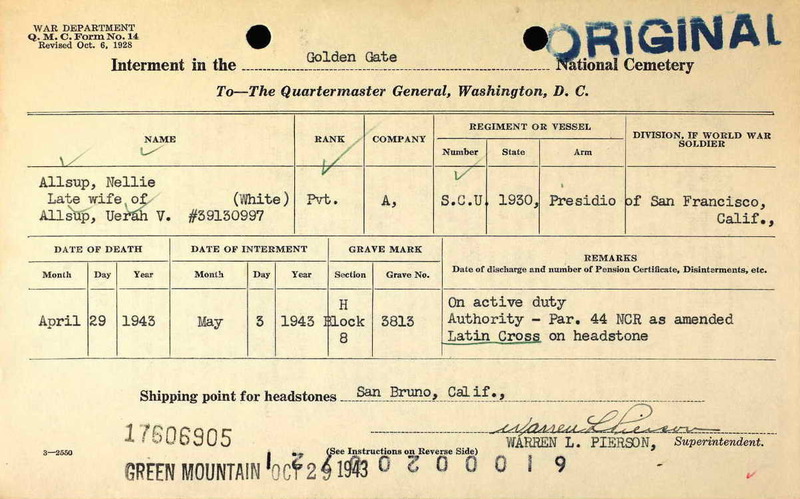 Uerah V. Allsup enlisted at San Francisco, California on 13 April 1943. His wife Nellie died 16 days later as shown on the above grave marker application. She was buried in Section H Site 3813 of the Golden Gate National Cemetery, San Bruno (San Mateo county), California. Pvt Allsup was a member of Company G, 508th and received the Bronze Service Arrowhead device for the Holland campaign and Airborne operations. Uerah died on 27 May 1964 in Stanislaus country, CA, an area that is not far from the cemetery where his first wife had been buried. However, he may have remarried a woman named Ruth and his place of burial is as yet unknown.